American professional golfer Tony Finau is known for his unparalleled skills and tenacity which has taken him places in the sports. The golfer has had his impact felt in the PGA Tour where he plays. After standing out in his amateur years, Finau went professional at a young age and proved himself amid his counterparts. The golfer’s life has been a point of interest to his teeming fans who keep asking questions about his personal life. Find the answers to all the questions about Tony Finau below. Who is Tony Finau the Professional Golfer? He was named Milton Pouha “Tony” Finau at birth on September 14, 1989, in Salt Lake City, Utah. Growing up in his birthplace, he developed an interest in golf and played consistently all through his high school and college years. Finau took Utah by storm during his amateur career clinching several titles for his distinguishing victories. He bagged the Utah State Amateur Championship in 2006 after he defeated Daniel Summerhays in the 36-hole championship match. His victory at the championship earned him a lot of recognition from stakeholders who admired his skills. Finau was initially offered a college basketball scholarship, but he turned it down and focused on golf instead. With the passion for golf blazing inside of him, he pushed college aside and became a professional golfer in 2007 when he was 17. He started out with mini-tours like the Gateway Tour, NGA Hooters Tour, and many others. In 2009 he competed in The Big Break and finished second. The golf player made seven cuts in eight starts at PGA Tour Canada in 2013. The Web.com Tour qualifying school that same year saw Finau finish T-3 bagging his Web.com Tour card for the following year. After finishing 8th in the regular season and 12th in the Web.com Tour Finals, Finau got his card for the 2014/15 season. He was further pushed to popularity in March 2016 when he won his first title at the Puerto Rico Open which also pushed him to top 25 in the FedEx Cup standings. At the US Open of 2018, he finished in fifth place after he made a double-bogey on the 18th hole, a feat regarded as his highest finish in a major tournament. Finau earned the praise of his counterparts as well as other stakeholders following his record-breaking feat at the 2018 US Open. The PGA Tour is sure to see more of his distinguishing feats. Having gone pro at the young age of 17, Finau recorded a good net worth before even stepping into the peak of his career. The PGA Tour golfer sits on an estimated net worth of $8 million which he has his unparallel skills to thank for. In the early part of 2018, the 2016 Puerto Rico Open winner signed an endorsement deal with Ping. Following the contract, the golfer makes use of Ping clubs including iBlade irons and an i200 3-iron. 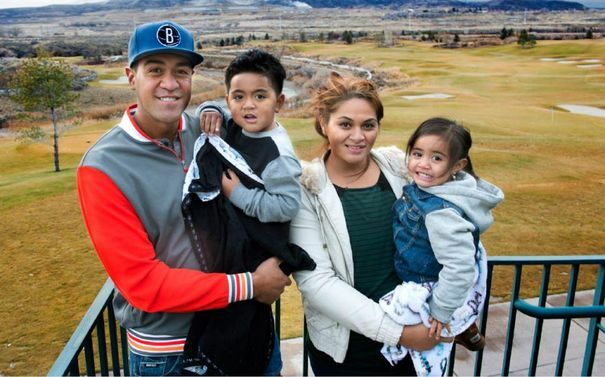 Although he seems so entangled with his professional life, Tony Finau always makes out time for his family. He is married to Alayna Finau. There is little or no information about any wedding of any sort, but the two have been regarded as a married couple given their long-term relationship as well as their kids. Together, the lovely couple has four children who live with them in their home in Lehi, Utah. Tony Finau was born to Kelepi Finau his father and Ravena Finau, his mother. He is of American nationality and of Tongan and American Samoan ethnicity which was where his father Kelepi had migrated from to settle in the US. He has a brother Gipper Finau who is also a golfer. Finau competed alongside his brother Gipper on The Big Break in 2009. The two brothers started at a young age to play the game of golf but Finau has gained more weight in the sports. Their parents were very supportive of their career choice and threw their weight behind them despite the financial challenges experienced by the family in their beginning days. At the age of 16, Gipper participated in the Utah Energy Solutions Championship although he did not come out as a tournament professional. Finau is also a cousin to NBA player Jabari Parker.